Microsoft has stopped supporting Windows XP, Now what? 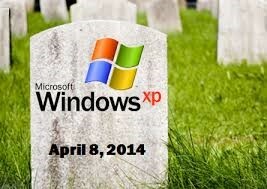 Microsoft stopped supporting Windows XP, Is it the end? April 8, 2014, the day when many users of Windows XP became disquiet after knowing that they would not receive security updates & technical assistance any longer from Microsoft. Nevertheless, it is not the end of Windows XP! Microsoft has stopped supporting Windows XP means Microsoft has stopped providing Microsoft security essentials for Windows XP as there will be no longer real time protection from spyware, rootkits, worms, Trojans and viruses. Lesser security can leave your system vulnerable to malware attack and results in system exploitation. Regardless of not being supported by Microsoft, there are millions of people who are using Windows XP throughout the world. The reason behind this, either users are finding costlier to upgrade Windows XP in their multiple systems or they are used to work on the same. However, users are not receiving any security updates from Microsoft so virus can easily enter in the machine & it can corrupt their precious data. As Microsoft has stopped supporting Windows XP & your system has not been receiving any updates since April 8, 2014, your data can easily be prone to virus attack. Besides, virus makers must be developing malicious software especially for Windows XP as they know there is no more security in Win XP. Therefore, users are required to have an antivirus installed & updated on their system & make sure to back up the data in regular basis so that in case any data loss happen due to virus infection, your data can easily be restored. Moreover, Microsoft has stopped supporting Internet Explorer 8 so it is recommended to use either Mozilla Firefox or Google Chrome browser so that your system will be insusceptible to malware infection. Even though prudent actions have been taken, there is no assurance that your system will be protected since a lot of malware programs exists or being created by virus attackers that can alter your data, can steal your confidential information & can corrupt your data files. The more you use Windows XP, the more viruses can enter to your system that results in data loss & data corruption. In such situation you need to recover lost data using any windows data recovery software that can get back lost and deleted files & folders. Copyright © 2007-2019 | www.windowsdatarecoverysoftware.com | All Rights are Reserved.